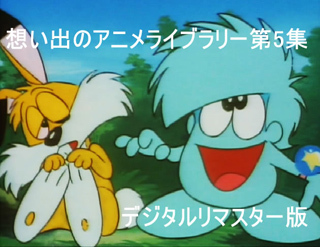 Now *maybe* you consider yourself a knowledgeable otaku because you know who Osamu Tezuka was, and maybe you also know a few other big names such as Leiji Matsumoto, Satoshi Kon and Hideaki Anno. 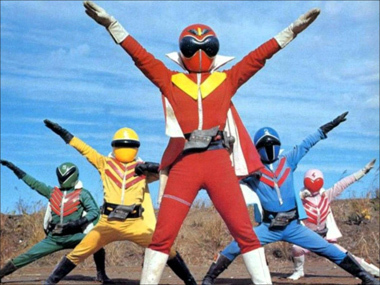 However, anime fans are few and far between who know who Shotaro Ishinomori was, and yet, because of his work, you probably grew up watching a certain set of color-coded morphin' rangers! Like many superstars of anime and manga, Shotaro Ishinomori was a protege of Osamu Tezuka, and worked as an assistant to Tezuka helping illustrate "Astro Boy" as a manga. 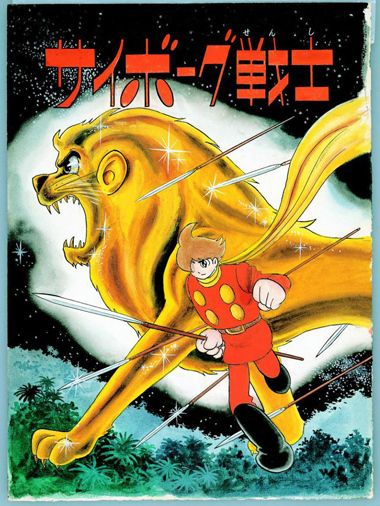 It didn't take long however, for Ishinomori to venture out on his own, and in 1963, he created "Cyborg 009". 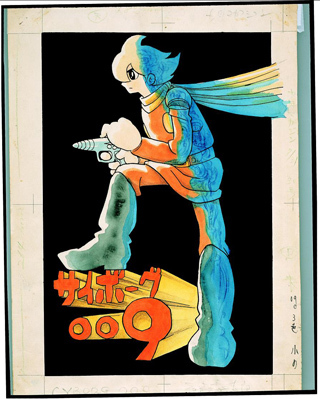 Below: Artwork for the original Cyborg 009 manga. It's impossible to overstate the impact of this manga. 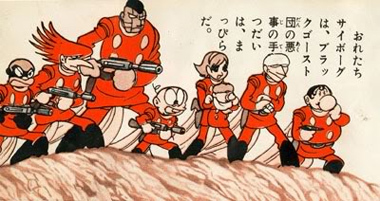 Cyborg 009 was Japan's first superpowered hero team, featuring 9 cybernetic warriors, and the concept and art style would influence generations of manga artists to follow. Cyborg was a smash hit, going on to several anime films, several different TV series, and even some "reimagined reboots" the way we seem to do with Spiderman movies. Looking at the art through a modern lens, you might say that Ishinomori used stereotypes to differentiate the characters in Cyborg 009 (some might even say racist stereotypes), but that's not the case. You need to look at his ultra-clean, minimalist style. He's using visual shorthand, trying to get the maximum impact with as few lines as possible, which makes his characters easy to animate and allows for a more fluid style, garnering more action on-screen. His dynamic, streamlined style has influenced everyone from Mitsuteru Yokoyama, (creator of Giant Robo) to Brad Bird's "The Incredibles", which in turn, influenced an entire genre of minimalist superhero comics. 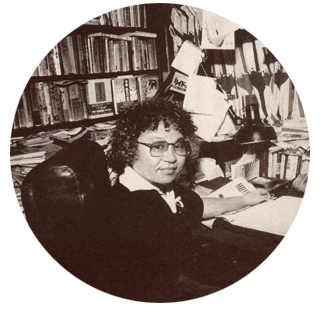 Every anime and manga that uses a heroic team, where each member contributes their special ability to the overall goal owes a debt to Ishinomori. That alone would be enough for most people; but Ishinomori would not stop there. After creating Cyborg 009, Android Kikaider, and a plethora of other manga/anime superstars, he turned his attention in a completely different direction..... to "Live-Action" TV. 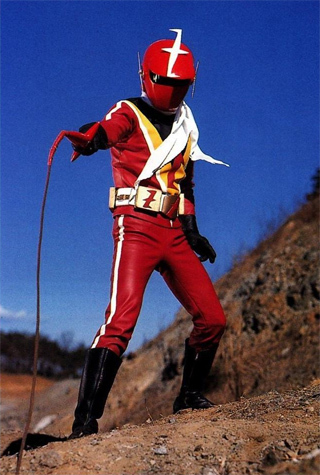 Ishinomori created the first live-action costumed superhero shows of Japan. The success of the tokusatsu superhero TV series Kamen Rider, produced by Toei Company Ltd. in 1971, led to the birth of the "transforming" (henshin) superhero (human-sized superheroes who transform by doing a pose, and use martial arts to fight henchmen and the weekly monster), and resulted in many sequel/spinoff shows that run to this day. 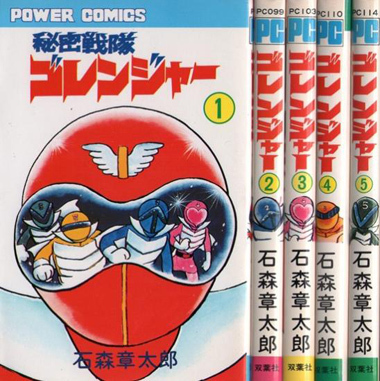 Below: The Himitsu Sentai Goranger manga and the live action television series. These sentai series continue to be produced in Japan regularly, and of course, at least one of these shows was the basis for what you likely grew up with (or if you're older you certainly knew about) - The Mighty Morphin' Power Rangers! So, Ishinomori created an entire genre of TV entertainment that is enjoyed the world over, that is copied, parodied, honored and respected and is ultimately a part of mainstream culture - and one of Japan's greatest exports. 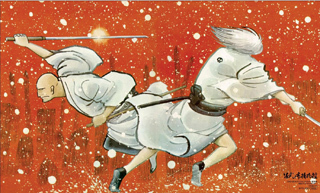 Below: The manga Sabu to Ichi Torimono Hikae from 1966 which became an anime series in 1968. 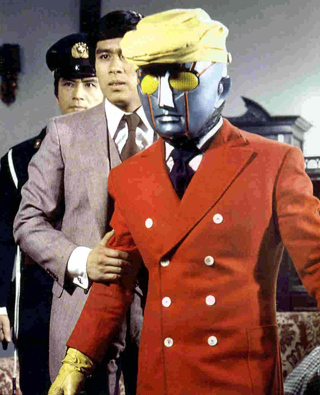 Below: The superhero TV series Robot Detective created by Shotaro Ishinomori in 1973. Below: The anime series Hoshi no Ko Chobin (Chobin the Star Child) which was created by Shotaro Ishinomori in 1974. Below: Kaiketsu Zubat was created by Shotaro Ishinomori and aired in 1977.